Katrina Lenk and Tony Shalhoub in The Band's Visit. Photo by Ahron R. Foster. BOTTOM LINE: A captivating musical about an Egyptian band in an Israeli desert in which humor, beauty, and talent all fuse together seamlessly. "Once not long ago a group of musicians came to Israel from Egypt. You probably didn’t hear about it. It wasn’t very important." With these lines, projected during the overture, The Band's Visit, a gem of a musical by David Yazbek and Itamar Moses, begins. The thing is, what seems unimportant can, if we are open to the possibility, affect our life, or at the very least, touch our heart. 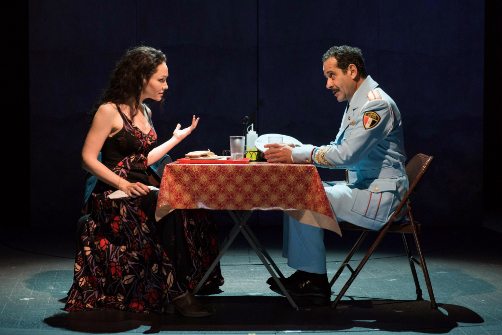 The Band's Visit demonstrates just that with a vibe of love and a rhythm of humor. Tewfiq (Tony Shalhoub) is the conductor of a ceremonial Egyptian police band, which is traveling to Petah Tikva, Israel, to perform at the Arab Culture Center. 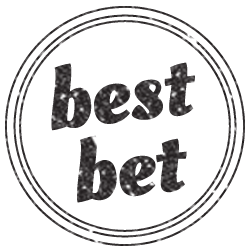 Due to a mix-up, the musicians find themselves in Bet Hatikvah, in the middle of the desert, where Dina (Katrina Lenk), owner of the local restaurant, informs them there is “not culture at all.” Since there is not another bus leaving until the morning, Dina and some locals offer the men places to stay. Dina, a beautiful and forlorn enigma, brings the solemn General Tewfiq and the flirtatious Haled (Ari'el Stachel) home with her. The jobless Itzik (John Cariani) brings Camal (George Abud) and Simon (Alok Tewari) home to his wife Iris (Kristen Sieh) and his father-in-law Avram (Andrew Polk). And the awkward and shy Papi (Daniel David Stewart) sets the cafe up for the other three band members to sleep. We then see each of these spectacular characters help the others think, learn, and grow over the course of this one night. For thousands of years Hebrew-speaking individuals and Arabic-speaking individuals have been at war. The Middle East is a well-known petri dish for growing anger and judgment. At a time when it is especially critical to make an effort to understand each other, we see that there are wonderful people in all cultures who simply want to connect and grow. What makes The Band's Visit special is its ability to let those cultural differences color the show's world, but not rule it. When we see Egyptians and Israelis interacting in the midst of stares and those who want to pick fights, we see that these characters would not be so callous as to judge someone based on their religion or the language they speak. Those who speak Arabic and those who speak Hebrew all meet on common ground, conversing in English. And the most wonderful aspect—how each character is open to being influenced and emotionally touched through the developing conversations. It is easy to forget that The Band's Visit is a musical, because the songs weave in and out of the production so effortlessly. They are truly woven into the seams of the story at a point when the spoken word is not enough; song is all that will suffice to communicate the energy and emotion felt within. From “Beat of Your Heart” to “Omar Sharif” I adored each song, but Katrina Lenk's voice gave me chills. And every time Lenk turned and looked at Tony Shalhoub, I melted. Each and every time. Lenk and Shalhoub steal the show: their interactions are a beauty to behold and the very essence of clouds, with so much room to breathe and expand. There is also such joy in watching Stachel and Stewart interact as opposites, one debonair and the other klutz, not to mention the amazement of seeing Tewari, Abud, Cariani, and Polk dance and croon. But Lenk is a gem; her humor and pensive demeanor astound. And none of this would be possible without writers David Yazbek and Itamar Moses (and perhaps also Eran Kolirin, who wrote the original screenplay) and director David Cromer, the creative team that makes it possible for these incredible actors and musicians to share their gifts with us. This production leaves no theatrical element unaccounted for—from the sets by Scott Pask, to Yazbek's music, to Cromer's pacing, everything hits the right chords. And I look forward to a cast recording (please Atlantic!) so I can hear the songs again, insert myself into this world, and once again hear the stories of each of these characters' lives. And not just the leading named characters—even the story of Telephone Guy (Erik Liberman) left me wanting more. Certainly there is magic in being given less than two hours to spend with The Band's Visit—the short length makes this gift of a show all the more priceless. But this doesn't change the fact that I am still yearning for more. The Band's Visit is written by Itamar Moses, with Music & Lyrics by David Yazbek, based on a screenplay by Eran Kolirin. Directed by David Cromer. Choreography is by Patrick McCollum. Set Design is by Scott Pask. Lighting Design is by Tyler Micoleau. Costume Design is by Sarah Laux. Music Direction is by Andrea Grody. Stage Manager is Richard A. Hodge. Sound Design by Clive Goodwin. The cast is George Abud, Bill Army, John Cariani, Katrina Lenk, Erik Liberman, Andrew Polk, Rachel Prather, Jonathan Raviv, Sharone Sayegh, Tony Shalhoub, Kristen Sieh, Ari'el Stachel, Daniel David Stewart, Alok Tewari, Harvey Valdes, Sam Sadigursky, David Garo Yellin. The Musicians are Andrea Grody, Jeff Theiss, George Abud, Sam Sadigursky, Harvey Valdes, David Garo Yellin, Alexandra Eckhardt, and Philip Stuart Mayer.